With Seattle being one of the top 10 (ranked at #5 according to the Huffington Post) fittest cities in the nation, as a neighboring city we would like to claim the prize as well. Being a part of the beautiful Pacific Northwest naturally makes us outdoorsy folk and with being active, we’re also looking at good health and a nutritious diet as well. 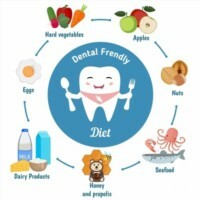 Do you know the affects your diet has on your oral health? Usually when we’re out and about exercising, hiking, staying active, we’re always thinking about which foods will benefit our body and energy levels but we forget that these foods will benefit our teeth as well. Let us tell you how. A nutritious diet consists of lots of fruits and vegetables, rich in vitamins A, C, and D – all in which will help strengthen your teeth. An excellent source of vitamin A comes from carrots. They aren’t just good for eyesight; they’re good for teeth health as well. Consuming foods high in vitamin a encourage saliva production in which contain enzymes that buffer out the pH in our mouth, making a high acidic environment relatively neutral. With decreased pH levels, we become more susceptible for tooth decay so eating foods with high vitamin A content will help clear out any harmful bacteria from adhering onto the surfaces of your teeth. Don’t be fooled into thinking it’s time to eat oranges and other citrusy fruits. Citruses have a high acid content that ultimately breaks down tooth enamel. Instead, opt into eating red peppers or sweet potatoes. Proactive care for your gum health will keep your teeth sturdy and in place. We’ve all heard it from our mothers growing up, “drink milk – it’ll make your bones and teeth strong!” Well, mama ain’t raise no fool. Dairy products are high in calcium which promotes strong bones and teeth. So balancing a high calcium diet with vitamin D rich foods will increase calcium absorption in order to maintain your teeth strength. Milk and cheese also contains a protein, casein, which prevent decay-causing bacteria from long-term attachment on the teeth. Vitamin D rich foods you can include in your diet consist of fish, eggs, and mushrooms. In order to reap all of calcium’s benefits, it’s important to include phosphorus rich foods into your diet as well for the two together optimize the body’s ability to metabolize it. While you can find phosphorous in many dairy products, other foods that have a high concentration of phosphorus include red meat, fish, tofu, beans, and lentils. Limit sugary foods, drinks and frequent consumption of carbohydrates to restrict yourself from feeding the decay-causing bacteria in your mouth. Revoking their diet will prevent decay in your teeth. To minimize the bacteria rest-time on your teeth, brush after meals to attack 60% of your teeth’s surfaces and floss to handle the remaining 40% and if you can’t do that, giving a quick rinse will suffice. Treat your teeth as you would treat your body – being mindful about your diet and making healthy choices will grant you rewarding results with your body and teeth! Let us know what other great foods you include your diet that help your teeth or be sure to inquire below in the comments for more examples!